This past weekend I enjoyed my first ever professional massage! And not just any massage, but a maternity massage. Maternity massage… sounds amazing, right? At a time in your life when you’re feeling tense, in pain and just generally uncomfortable, what could help you relax better than a professional massage? But it didn’t end up being as glorious as I had imagined. Embarrassing before and after sefies. Peter had given me a gift certificate to Neroli Spa (for a maternity massage) as an early Christmas gift when I was pregnant with Corban. Little C came just two weeks later, though, so I never ended up using it. This time, I vowed, I would schedule that massage before it was too late! 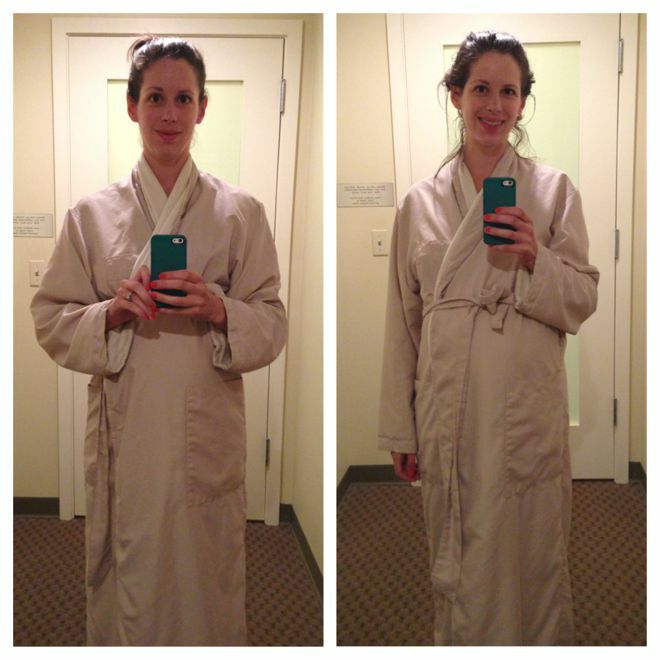 So at 35 weeks, I finally got a 35-minute maternity massage on the books. I was glad I had waited until later in pregnancy, because my lower back started aching and I just was feeling more uncomfortable than ever. Essentially, a maternity massage is just a regular massage, but they have a special pad that you can lay on to accommodate your protruding belly. The masseuse warned me that it was highly possible I would start feeling short of breath or nauseous after some time lying on my stomach, so she would start with my lower back to make sure we got that in while I was still comfortable. Sure enough, after 10 minutes of bliss on my belly, I started to feel sick. She had me turn around into a partially reclined position on my back, where she could still massage my neck, shoulders, head, etc. Again, I started out feeling great, but within a few minutes was feeling sick again – this time, I thought, due to the strongly scented oils. She kindly wiped off the oil and proceeded again, but eventually I needed yet another break to sit fully up and drink some water. While my neck, shoulders and head enjoyed amazing relaxation, I couldn’t fully appreciate it as I battled that horribly uncomfortable feeling of nausea that I thought I had left behind in the first trimester. I silently was thankful I hadn’t booked anything longer than 35 minutes. How regretful to be treated to such bliss and not be able to enjoy it! Apparently, this is common for pregnant women who come in for a massage. I’m sure there are some who have no issues, but sadly I was not one of them. It wasn’t a total bust – there were parts of the massage during which I felt fine and really enjoyed it, and afterward I sat in the relaxation room for quite a while with a lovely foot soak – but I will definitely wait until my body is back to normal before considering another massage. I guess during pregnancy (especially at this late stage) there is only so much you can do to get comfortable, and a massage can only be as relaxing as your body allows. I don’t hold it against the spa or the masseuse at all (in fact, she was so kind as to give me 10% off, I’m guessing since she knew it wasn’t as wonderful as I was expecting). I did leave feeling much more relaxed and rejuvenated, just not as completely as I would have were I not pregnant. Have you tried a maternity massage? Was your experience anything like mine? Well this makes me feel a little better about the fact that I can’t get a massage right now. I’ve actually never had a professional massage. I’m too cheap lol. Haha, me too. But I do have another massage gift certificate that I am excited to enjoy when I’m not pregnant! I’m entering second trimester and my dentist advised me not to make any appointments during third trimester. I was a little confused about this – even though I am a doctor who takes care of pregnant women! – because you seem to be the ONLY person in the entire world who talks about these things in detail!!! Now I understand his concern that having to lie on my back for an extended period of time would be uncomfortable. Thanks again, as always, for sharing your experience. Aww, I know! So disappointing. I think this is a very good idea. My wife must try this, so she can get comfortable while pregnancy.